I was lucky enough to get my hands on a place at the 5 day Chocolate School at Squire’s Kitchen International School (Farnham UK) last week as, lucky for me, they had a cancellation. To be fair it wasn’t actually Willy Wonka himself, in fact his name was Mark Tilling (but “week with Willy Wonka” has nice alliteration does it not?) and I’m quite confident that Mark’s skill with chocolate would outstrip Mr Wonka any day. Mark was ranked “World Chocolate Master” from 2006 – 2010 and is an all-round lovely guy. We started the week by learning to temper chocolate, something I’ve always been a little scared of but it was actually quite easy. I never actually understood what “tempering” chocolate did but it’s all to do with having melted workable chocolate that still has a strong crystal structure so that it will set quickly and hold it’s shape. To do this it needs to be heated to about 45 degrees and then cooled rapidly to around 31 degrees. We cooled it by adding unmelted chocolate to the melted bowl which brought down the temperature. No need to slosh it around a marble slab after all. On Day 1 we made 3 simple bars of chocolate. 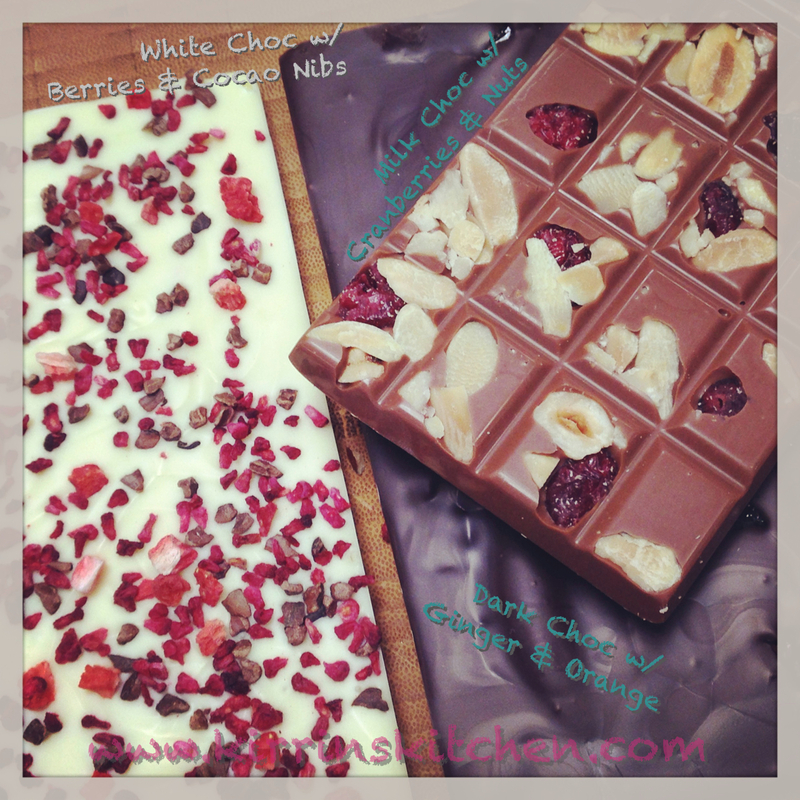 I made one in white chocolate with raspberry, strawberry and cocoa nibs, one in dark chocolate with crystallised ginger and candied orange, and one in milk chocolate with nuts and cranberries. It was nice to go home with a little something in hand. Next we made petals for what was to become a chocolate flower. This was quite satisfying. 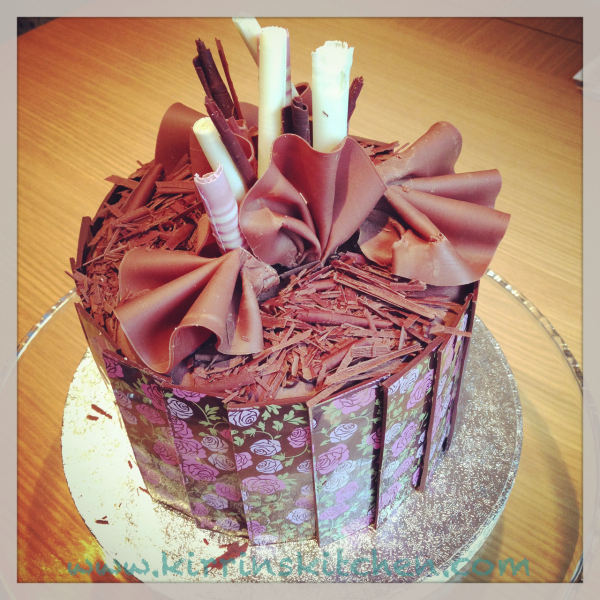 I’ve done a lot of work with sugar flowers for my “Kirrin’s Cakes” but never in chocolate before. It was genius, just by dipping a small pointed knife in melted chocolate and transferring it to a strip of acetate, each petal only took a few seconds. The catch was working quickly enough to make all your petals before the chocolate set too much, and then being careful not to re-warm it too much and de-temper it… not admitting for a second that I did that at all. Lastly we used ‘transfer sheets’ to made patterned swirly chocolate spikes and also made two huge chocolate hemispheres using polycarbonate moulds. Today we turned our two hemispheres into a giant sphere, like an enormous hollow malteser. We mounted it on a solid chocolate plinth (about the size of an ice hockey puck) and airbrushed the whole thing with a chocolate and cocoa butter mix. Next we made a heavy chocolate ‘stick’, as in it looked like a piece of driftwood. At this point I had no idea what we were aiming for so I was a little confused as to why we were piping large quantities of dark chocolate roughened up by the addition of cocoa powder, onto scrunched up cling wrap. After piping our rough stick shape we painted it a coarse brush and with coloured cocoa butter to give it texture and colour variation. When done it really did look like wood. 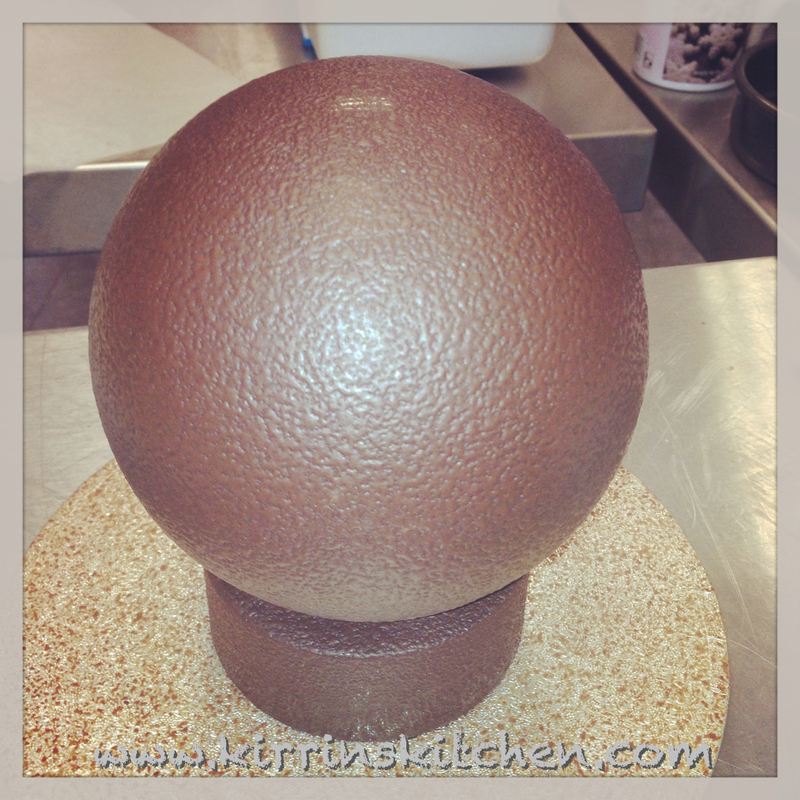 Our chocolate stick we attached to the giant sphere using melted chocolate as glue and set it quickly with ice-spray. 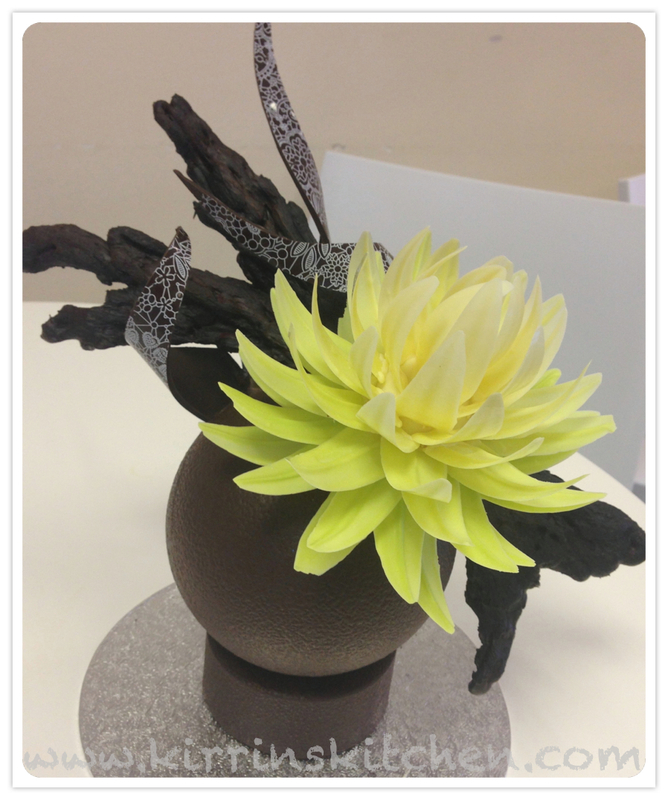 Lastly, but certainly not least we had to construct our chocolate flower using yesterdays petals. Each petal was attached individually using “chocolate glue” and freezing it into place with the spray. I must admit, every time I look at this I can’t believe I made it. I expected to spend the week tempering, making chocolates, truffles and maybe some modelling. But this, THIS, I never dreamed I would make. Today didn’t have quite the wow factor of yesterday, let’s face it how could we top that?? We still covered a lot of new ground. It was more about techniques than a finished product. First we baked Guinness chocolate cake for decorating later. Mine was a bit of a disaster. I amended the recipe of the fly to be both gluten free* and dairy free and then it also got a bit burnt. Had I been home that night I would have baked a replacement. (*it occurred to me later that the GF efforts were a bit pointless as there was Guiness in it. What was I thinking?). 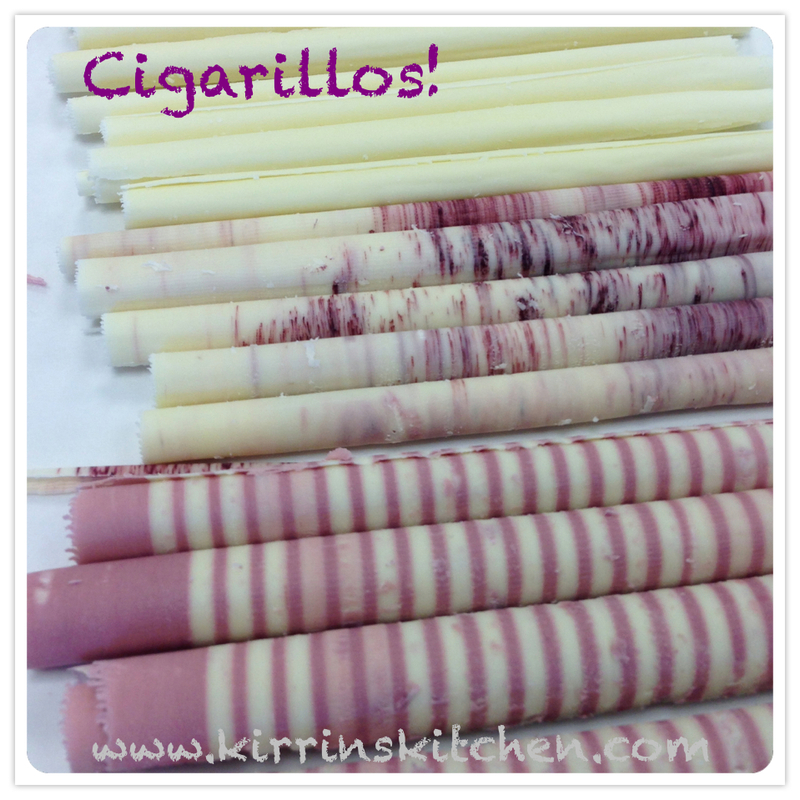 Next we learnt to make ‘cigarillos’. You had to rub/paddle tempered chocolate into a thin layer across some cool marble. Then when it had set just the right amount, use a giant scraper at just the right angle and at the right speed to get it to roll up into these little flakey tubes. I think this process is exactly how Cadbury flakes were invented – by someone learning to make cigarillos because you end up with a massive pile of Flake looking disasters! After I finally succeeded making plain white ones I started to add colour. The middle ones I added coloured dust and poured chocolate over the top. The stripey ones you spread one colour, comb it, then quickly spread the second colour. This afternoon we made “fans” using a piece of marble from the freezer. Mark the teacher made it look so easy! It wasn’t. You have to work so fast because the marble is so cold the chocolate sets very quickly. Mine definitely were not awesome, but a few were ok.
Today we made lots of ganache. My first lot I made dairy free to use it in my cake (which was also dairy free). Then layered the cake with ganache and strawberry jam, covered it in ganache, then I did an awful job of covering it in a combination of fondant and modelling chocolate. – no photos of that one! We made another regular ganache for Marc du champagne truffles. When it had set we piped evenly sized blobs onto a tray ready for covering in chocolate and cocoa. Next we made salted caramel (yum!) and used it to fill the chocolate shells we made yesterday. 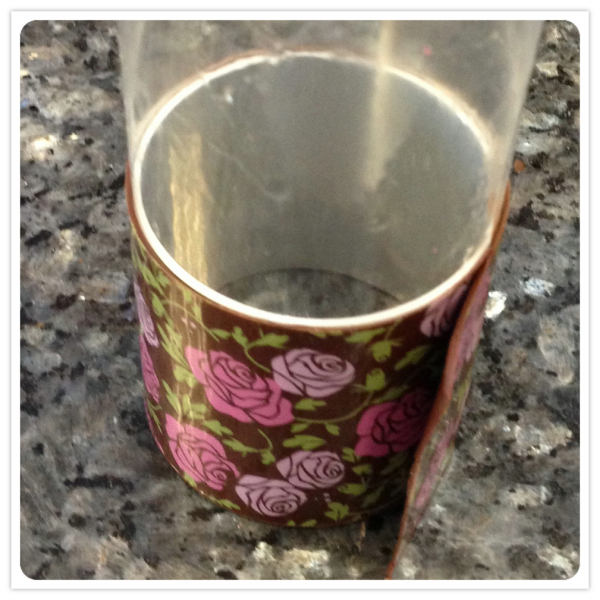 Lastly we used transfer sheets again but this time we used them to make decorative chocolate cylinders. We spread the tempered chocolate onto the transfer sheet then wrapped it around tubing whilst it was still not quite set. The end of a great week. 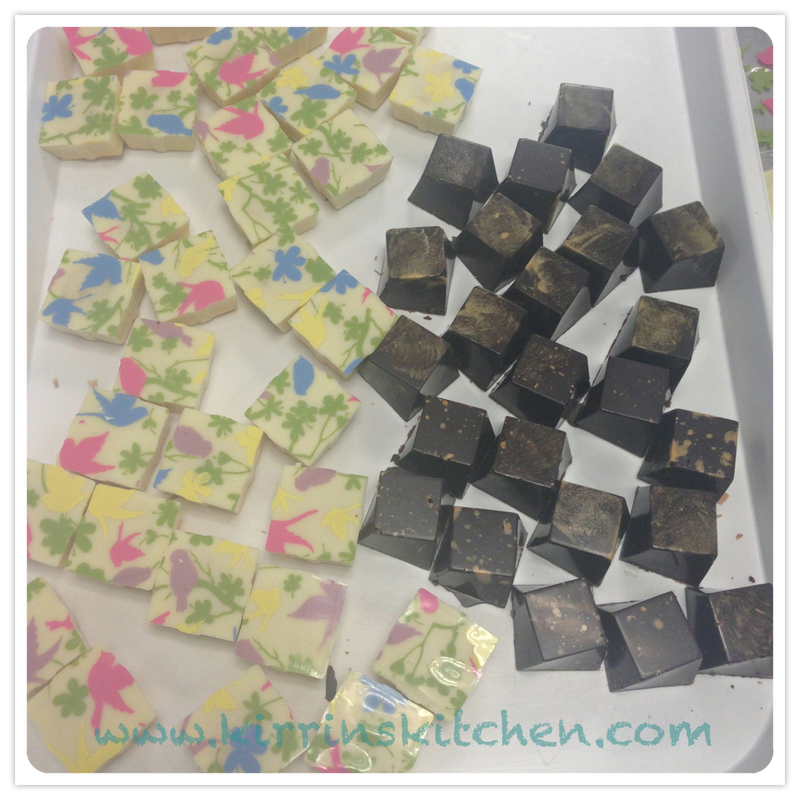 Today we finished off lots of things we started earlier in the week and made some more chocolates. First up white chocolate (with pretty pictures on them) filled with a passionfruit ganache – these are the winner. I could eat these every day. The tanginess (is that a word?) of the passionfruit really cuts through the sweetness of the white chocolate. We then used the salted caramel to fill some dark choc shells (with gold sparkles). Then the big cake! I wasn’t super pleased with mine but (aside from a few decorations on the top) it is dairy and gluten free. And it could have been worse, someone else’s slipped and when splat onto a table full of paper work. You could almost taste the horror in the room when that happened. Then last of all we filled our patterned chocolate cups with a caramel mousse. I stuck one of my cigarillos on top. I’ve come home with so much chocolate, the enormous cake, and a bit of a crush on the Chocolate Master. Well I can’t let all my new found chocolate skills sit idle. The first step will be to try and temper chocolate using the Thermomix. The new TM5 has a 45 degree setting so the melting to 45 degrees step should be quite straight forward. The trick will be in the rapid cooling. I know someone who has succeeded doing this using their TM31 so it is possible. I will definitely be making some of those passionfruit chocolates so I will be converting the recipe for the filling. Oh and the caramel chocolate mousse will be a doodle to replicate in the whizzy machine. I will have to get my hands on some transfer sheets so that I can make the pretty chocolate cups to put it in and wow people at dinner parties. 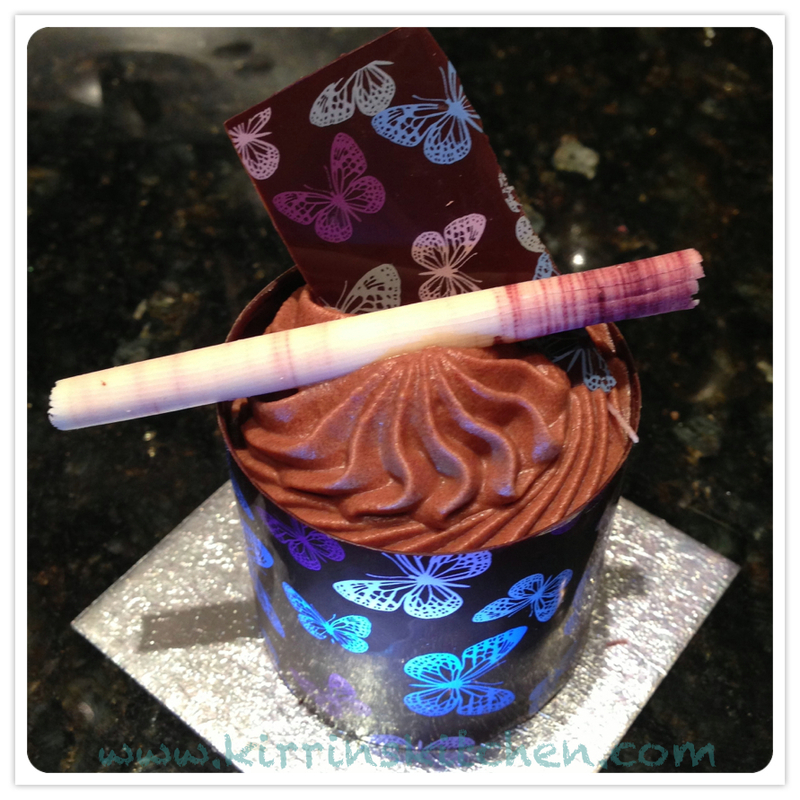 This entry was posted in Kirrin's Kitchen, Treats & Snacks and tagged cake, Callebaut, chocolate, cigarillos, Course, ganache, Mark, Squires, Tilling, truffles. Bookmark the permalink. And I agree, Chef Mark is rather crush-worthy, isn’t he? He was guest speaker at the first UK Thermomix Demonstrators Conference I attended back in 2010 and he wowed us with chocolate choux pastry. I really must rustle through my papers and find the recipe!! Yes, James Martin step aside! Thanks for the link about the tempering. I will give it a go very soon. It’s half term and my daughter is desperate to “make chocolate” so that might be a good opportunity.